If you have any questions about this product by Nature's Plus. 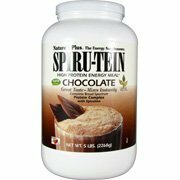 CHOCOLATE Spiru-tein 5 LB Canister, contact us by completing and submitting the form below. If you are looking for a specif part number, please include it with your message. Limitless NZT-48 PLUS Restoramones - 8 Drinks+10 Capsules - Powerful, Customized and Personalized Brain-Boosting Nootropic Drink Mix, with Restoramone Prohormone Blend - and BONUS Booster Capsules.